Recover Data Pvt. 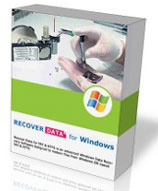 Limited has launched Windows Data Recovery Software version 3.0. The software incorporates features to perform selective file recovery, find feature to locate the files, and resume the recovery process at a later stage. It helps in retrieving data lost due to accidental formatting, power failure, HDD crash, registry corruption, boot record corruption, processor inconsistency, RAM errors, motherboard malfunctions, OS inconsistency, logical errors, physical damage, and system application errors. In addition, it possess ability to recover data lost due to emptying of recycle bin or by using Shift+Delete keys."